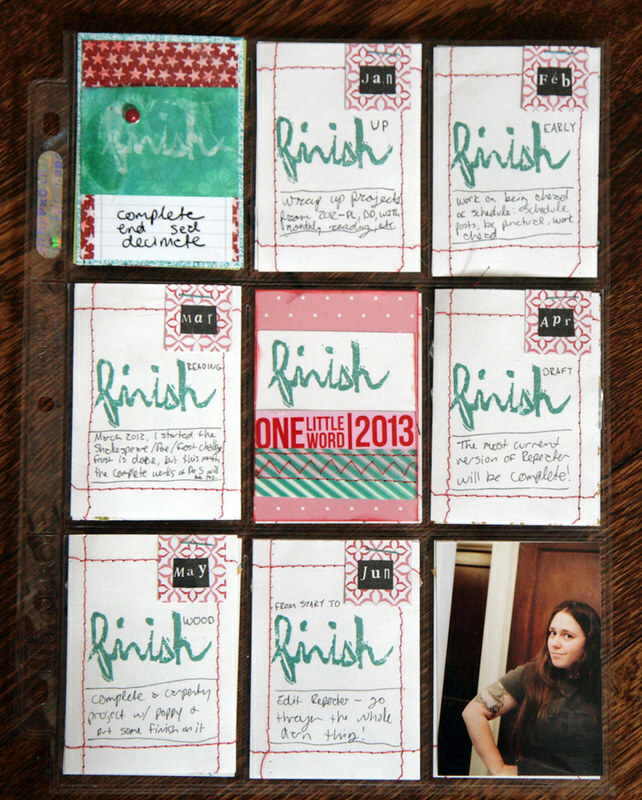 Jan FINISH up I will complete projects I started in 2012. Feb FINISH early I will work on being more punctual, not waiting until the last minute, and scheduling things ahead of time. Mar FINISH reading The material from the Shakespeare / Poe / Frost challenge I started last year will be completed. Apr FINISH draft I will complete the writing of the most current draft of my novel. May FINISH wood I will put finish on wood (hah!) on a carpentry project I will make with Poppy (my grandpa). Jun from start to FINISH The editing on the final draft of my manuscript will be complete! Jul FINISH fini I will finish reading a book in French. Aug FINISH trip We will come back from our first real family vacation to Yellowstone. Sept FINISHing touches My novel will be DONE and query letters will be out of the door. Oct FINSH line I will run a 5K (the Susan G. Komen Race for a Cure). Nov FINISH debt Our debt will be decimated! Dec FINISHed We’ll close the doors to our Etsy shop and I will enjoy the end of the year! 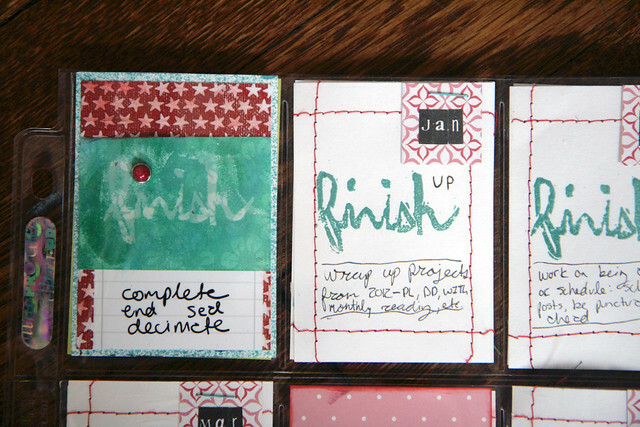 I’m using my January intentions + action in combination with ideas from the workshop I Choose by Elise Blaha Cripe to work on my FINISH up intention. So far I’ve caught up on all of my “behind” monthly reads posts (the December one will go up tomorrow). I’m about halfway done organizing and editing a big BIG batch of photos to be ordered for all of my mostly-or-slightly done memory keeping projects. And Jake and I have to finish painting two corners of our living room. But that’s just the January stuff. What I love about having the year laid out is it also makes me think about what I have to do now to accomplish what I want to happen months from now. If I want to finish Shakespeare and Poe, I have to read about 75 pages of Poe and 5 Shakespeare plays. I know that we have to save $500 this month to reach our decimate-the-debt goals. I know I have to work on my manuscript at least 8 hours a week. I know that I have to run and stretch if I want to be able to run a 5K by October. I know that I’d better be refreshing my French if I want to read a French novel this Summer. That seems like a lot, but those chunks are totally manageable for me. Breaking these goals down monthly is absolutely the best way to get myself to FINISH. 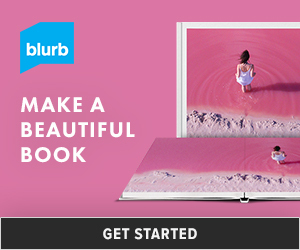 Have you signed up for One Little Word? How is your January assignment going? This post is fantastic and inspiring! 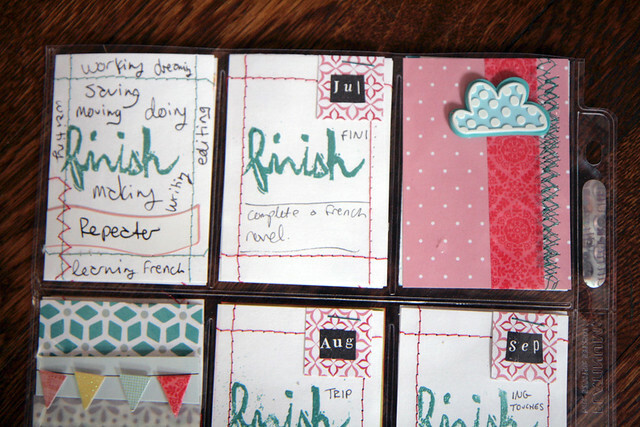 I’ve signed up for both Ali and Elise’s courses as well and while I haven’t had a chance to complete Ali’s January project I’m loving I Choose. I’m excited to see your progress. Do you have your word yet, Melanie? I have not signed up for the class, thinking I was going to take my own approach this year, but then seeing your first assignment I’m contemplating taking the plunge. Although last night I was going to sign up for Cathy Z’s eat well, move more because that’s what I really need 10 months post baby! HA. But the cool news is that my word came to me yesterday and it’s perfect. My word for 2013 is EMBRACE! I honestly thought the class sounded silly last year ( I thought, “Do you really need a class to choose a word?”) I didn’t really get how in-depth and awesome it was until I started reading into it further. I signed up for the class in 2011 and didn’t finish so I did the 2011 content in 2012. Now that she has all new prompts I am tempted to sign up, it’s just a matter of spending priorities. 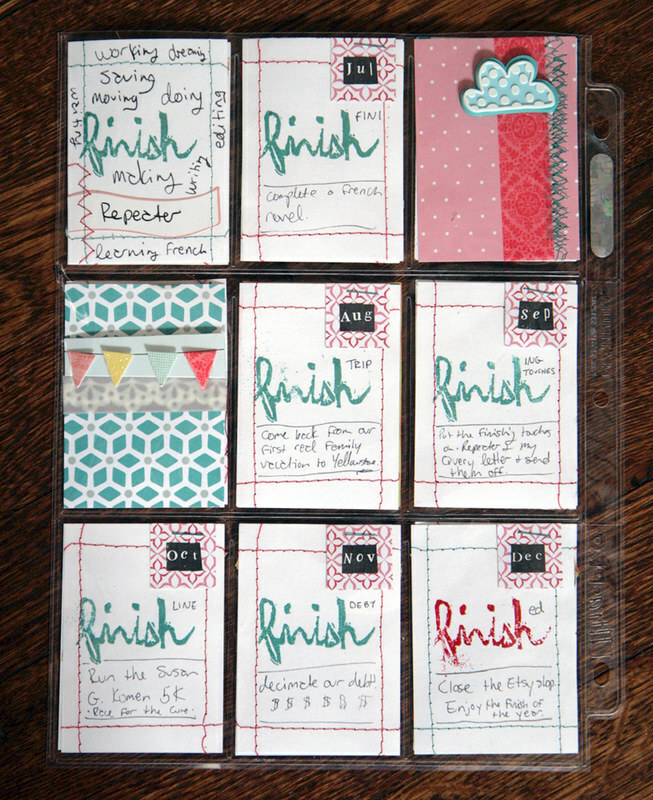 Finish was my second choice for my OLW, it is fantastic to see what you chose as your intentions. I still need start my page for the month, yikes! I think that BRAVE suits you. I also think it’s great since you’re working on so many long-term goals that won’t be finished this year, you have to be brave enough to walk towards them, but you might not cross the finish line on them this year because they are HUGE. I need to take a screen cap of this and somehow incorporate it into my OLW binder sometime this year! !